Keep gear secured at the waist where it belongs with the help of the PatrolTek 8110 Duty Belt with Hook Lining from Bianchi. Featuring an ultra-tough nylon web construction, the model 8110 provides the strength needed to support fully loaded duty rigs with ease. A reinforced hook lining provides a secure mounting platform so that the belt can attach to Bianchi liner belts for added strength and durability. The belt is closed with a tri-release shatter-resistant, polymer buckle that delivers a secure closure that will not break under pressure or when slammed, kicked and banged. I really like the way this belt functions and accommodates the equipment worn on it. 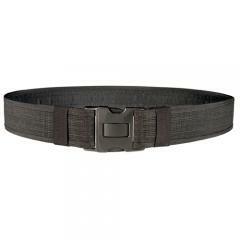 Great duty belt for the cost It is very sturdy and and holds weight of equipment very well.